YA Yeah Yeah: Friday Feature: Interview with Joe Craig PLUS UK Giveaway! Friday Feature: Interview with Joe Craig PLUS UK Giveaway! 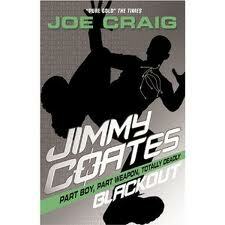 Joe Craig has very kindly donated two SIGNED COPIES of his new book Jimmy Coates: Blackout! If you'd like to get your hands on one, read below to find out how. NOTE: Competition entrants must be 13 or over and live in the UK. E-mail address and postal addresses of the winner will be passed on to Joe for him to send the books out, then deleted. 1. Enter on Twitter - follow @yayeahyeah and retweet the below tweet before 11:59 pm Sunday 2nd June UK time to be entered into a draw to win one copy! 2. Enter via e-mail - e-mail yayeahyeahcoatescomp@gmail.com with the subject "I Want Blackout!" before 11:59pm UK time Friday 7th June to enter. In addition to his generosity in providing me with two signed copies of the new book to give away, Joe also found time to sit down and talk to me about it. Thanks for the books, and an awesome interview, Joe! I have never done this. If I try it now I see couple of images very strongly, because they’re a couple of favourite photos that readers have sent to me. One is of a boy of about 12 with a huge, beaming smile, holding up a signed Jimmy Coates poster. The other is a boy of 10 sitting crosslegged in the corner of a bookshop, head bent forward, engrossed in Jimmy Coates: Killer. But when I’m writing I don’t imagine my readers. If I tried to write for some imaginary, universal ‘reader’, I’d be struggling to please someone who doesn’t exist in real life. All readers are different. They have different tastes, different energy, they’re different ages, some are boys, some are girls. When I’m writing, the reader I worry about is ME. I’m the most impatient reader and the most demanding audience in the world. For me to be happy, I will never settle for an easy escape, an obvious plot move or the first word that springs to mind. It’s the demanding, impatient reader in me that constantly pushes the writer. It can be frustrating, but the result is that eventually I end up satisfied with my finished story. 2. In a recent blog post, you showed your diagrams for plotting out Jimmy Coates: Blackout. Have you always planned your books out carefully like this, or do you ever start writing without knowing too much about what's going to happen? I always plan very carefully. If I started writing without knowing what’s going to happen I’d be improvising and would end up clutching at the first idea that came to mind or the first thing that made the story work. The point of planning is that I go through ten, twenty or a hundred different options, map them all out, with all their permutations and ramifications and I choose the BEST. I could probably improvise a story but it wouldn’t be the best version of that story… and what’s the point of that? Also, for me, the planning is the bit that’s most fun. I love the plotting and the puzzling out of twists, the building of characters and the bringing them together in different combinations and situations to work out what conflict will tell the story I want to tell. I’d never want to skip that part and just start writing. 3. You contributed a brilliant guest post to my other blog, YA Contemporary, recently, about questions in school visits you'd made. Did you ever have any authors visiting when you were at school? If not, which author would you most liked to have met as a teen? Thanks! I’m glad you liked the blog post. No, I never had an author visit me at school. I don’t think it even occurred to me that an author could be an actual, human, living person. I never gave it a thought. Once I hit my teens I was really into books about cricket and movie magazines – that’s virtually all I read from the age of about 11 to 17. The only fiction I read was Titus Groan by Mervyn Peake (which I loved). Honestly, the writers I wanted to meet were Tom Stoppard, David Mamet and Aaron Sorkin (because he wrote ‘A Few Good Men’, not because of West Wing). Once I hit 17 I discovered Paul Auster, who changed the way I thought about books. I was lucky enough to meet him, briefly, and get my copies of his books signed when he gave a talk in London a couple of years later. 4. As well as being a great author, you're also an incredibly talented singer-songwriter as well! Do you listen to music when you're writing? If so, is it your own songs, or someone else's? Golly – thanks! If there’s no music on, I can’t write. But some music makes me more productive than others. When I’m working on a draft of a book I keep a daily diary of music I’ve listened to that day, what I had for lunch, how many words I wrote and the time I finished work for the day. From this, I’ve scientifically calculated that the most productive combination of food and music is sushi plus Oscar Peterson. There’s nothing quite like Oscar Peterson. 5. In addition to all this, you're a screenwriter as well! Is there any chance Jimmy Coates will make it to TV or film? I’d love there to be a Jimmy Coates movie or TV series and I’ve been lucky that there’s been so much interest over the last couple of years. At one point there was a Jimmy Coates TV series in development in the US, but it didn’t go into production so now I’m back at square one and courting producers again. Hehe. I have no dwarf crocodile. I’m sorry. I don’t even know whether that’s a real animal. I sometimes make things up. It is, after all, part of my job. At school I convinced a classmate I was in line to the throne of the Solomon Islands. He believed me for about three years before he finally came across a picture of the people of the Solomon Islands and saw they were all black. 7. For fans who've read all of the Jimmy Coates books, which other authors would you recommend to them? There are so many great authors around now for anyone who’s a fan of Jimmy Coates or that whole genre of thriller. I wish they’d been around when I was at school; I’d have devoured their books. The obvious big name to recommend is Anthony Horowitz, but most people discover my books after they’ve already read all of his, (which is actually great for me because it brings lots of new readers to my books). I also suggest my readers check out Chris Bradford, Mark Walden, Andy Briggs, Anthony McGowan, Ali Sparkes, Barry Hutchison, Matt Dickinson, Marcus Sedgwick, Michael Carroll… and for my slightly older readers there’s Robert Ludlum (my favourite thriller writer of them all) and Robert Muchamore. 8. The Independent memorably praised your books for being able to drag teens away from their games consoles, saying "Super Mario is no match for this schoolboy assassin" - would Jimmy be able to take Mario and his brother Luigi in a fight? Ha. This is not a fair fight. Mario and Luigi are plumbers used to fighting giant apes with spanners. Jimmy Coates is a genetically engineered assassin who can smash through the windscreen of a plane, midflight, to catch a rocket he’s just launched that will zoom him into the path of his enemy. I’m not sure a spanner and a big moustache are going to trouble him. I just finished Agent Zigzag by Ben Macintyre and Revelation by CJ Sansom. (I usually have a fiction and a non-fiction on the go at the same time) I’ve just started Telegraph Avenue by Michael Chabon (who wrote one of my favourite novels, the Amazing Adventures of Kavalier & Clay) and I haven’t decided which non-fiction to pick up off my pile yet. I might re-read Rubicon by Tom Holland because it’s a cracker and I’d like to write a thriller about the Roman general and despot Sulla, or I might dive in to Monte Cassino by Matthew Parker, which looks riveting. 10. What's next for Joe Craig? I’m launching the new Jimmy Coates book (it’s out on June 6 and PR to do. At the moment that’s what’s keeping me from writing, but as soon as Jimmy Coates: Blackout is launched I’ll get back to the new book I’m working on… It’s a thriller that will hopefully be the start of a new series. I can’t tell you too much about it, of course, but it involves a boy and a girl escaping an evil organisation led by the pope (probably) and breaking in to ‘borrow’ the Large Hadron Collider at CERN. That kind of thing. I’m pretty excited about it. Meanwhile, I’m also due to deliver the next draft of the movie I’m working on, so I’d better get cracking on that too. Sounds great! Thanks so much for talking to me, Joe, and for the very generous giveaway! Jimmy Coates: Blackout is out in the UK on June 6th, and you can find more from Joe on his website, Twitter, and Facebook. Really looking forward to the book release in New Zealand!